If you love camping, you probably already know how important hot water can be. Sure, you can enjoy without it too, but having a portable water heater makes the entire experience that much better. So, the best thing you can do for yourself is to get a portable propane hot water heater for camping. That way, you, and people that came with you will have access to hot water if you need it. Of course, buying a portable propane hot water heater for camping is not quite that simple. There is a number of things you have to consider before making a purchase. These heaters are small, compact, and quite handy. Just like the usual water heaters, some of them have tanks, while other are tankless. After all, there are things that you enjoy in your everyday life that you would probably enjoy even more while camping. There is no reason for you not to have access to a hot water shower, clean dishes, and even coffee. However, realizing that you should get a portable water heater is the easy part. The hard part is figuring out which one you should get, making sure you are getting a heater that is powerful and reliable enough. And most importantly, a model that is safe to use. That is why we are here, to help you out by recommending some of the best heaters out there. So, without further ado, let’s just jump right into this and list out the top 5 portable water heaters you can get. When it comes to portable water heaters, Eccotemp is probably the most dominating manufacturer you can find. So, we will start the list off with the Eccotemp L10 – a small, yet powerful tankless heater that will make your camping experience a lot better. This propane-burning water heater is an excellent choice for RV and camping trips. However, even though it is portable, it is much better to use as a semi-permanent installation. The dimensions are 8 x 14 x 25.5 inches. And it weighs in at 27 pounds, which does make it a bit heavy for a portable machine. But, in the end, it offers a lot for anyone using it. This tankless heater will offer a steady supply of hot water wherever you are. In fact, it can give you up to 2.65 gallons per minute. That is a lot more than you will probably need on a camping trip. You could actually run a shower and wash dishes with water at the hottest setting without straining this heater. The temperature settings are also quite impressive themselves. You can set the water temperature to be anywhere between 80 and 165 degrees Fahrenheit. To save electricity, this heater will only start with the battery ignition once it detects running water. When it comes to the heating power, this unit boasts an incredible result of 74,500 BTU. Another thing you should keep an eye out when it comes to any water heater is energy efficiency. And Eccotemp L10 boasts an excellent score of 85%. However, it also has an excellent automatic timer set-off function. That feature will turn the timer off while you are not using the water heater, which makes it safer and economical. The timer shuts the heater off after 20 minutes of idle work. The heater will turn on again as soon as there is water pressure coming through the system. It also boasts an effective cut-off function in case of a flameout. One of the things that we absolutely love about this unit is how efficient it is. Not only does it spend less gas than most of the other heaters, but it also works quite quickly. Once we let the water flow, it took a few seconds to get it to warm, and a bit more to get it too hot. If you are going for real portability with your water heater purchase, then Camplux 5L could be perfect for you. You can easily carry this heater anywhere you want to go. And it will always run with minimum energy. This product is usually a great choice for families who like to travel a lot. This handy tankless heater weighs only 10 pounds, and its dimensions are 11.4 x 5.5 x 14.6 inches. You can easily fit this heater in your car, RV, or even a backpack if you are feeling adventurous. Also, if you are traveling with your kids, you can let a 12-year-old carry it around. Not only will this heater fit perfectly on your RV, but it will also work even at the lowest PSI. In fact, it is the most efficient water heater when it comes to working with low PSI. It will activate after detecting pressure that is as low as 2.0 PSI. And that is great news for anyone who worries about the low gallon per minute output you can get at some locations. Namely, one of the most popular options in the States is to travel to a cabin in a forest. And, sometimes, those cabins don’t get a lot of pressure at all. Thankfully, this water heater will work with the water flow of only 0.4 gallons per minute. With small pressures, the 34,000 BTU per hour this unit outputs will be more than enough for you. 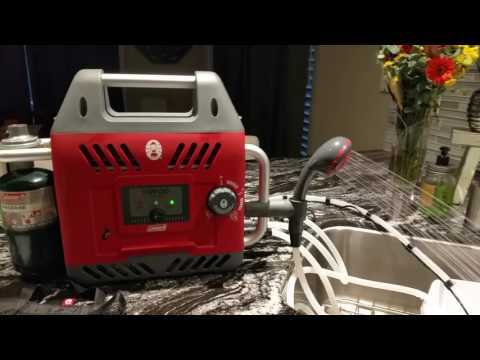 Since this unit comes with 2D batteries and works on propane, it is also a great choice for off-the-grid trips. We also love the fact that it takes next to no skill to install this heater. It actually comes with everything you might need to set it up properly. It is a 20-minute job for anyone willing to do it themselves. However, it, unfortunately, comes with non-standard connections (for North America, that is). So, if a part breaks in time, you will have to either buy it online or be ready to spend some time looking for it. On the flip side, you don’t have to set up wall venting at all. The Camplux 5L works perfectly even with low PSI levels. It can work with as little as 0.4 gallons of water per minute. While it works with low pressures, it doesn’t work great if you want high water supply per minute. If you are ever in need of hot water, Coleman Hot Water On Demand H2Oasis will be ready to serve you. It is compact, portable, and it is actually self-contained. The first thing we noticed was how sturdy this unit is made. It is the first heater we got our hands on that we felt was near indestructible. The Coleman H2Oasis weighs in at around 18 pounds, and the external dimensions are 21 x 10 x 16.7 inches, which makes it one of the lighter heaters you can find. However, it is not quite as light as some other models. But, if portability is one of your main concerns, you can always get a carrying backpack for it. We would highly recommend buying the carry bag. It is sturdy, comfy and the H2Oasis fits in it perfectly. Furthermore, you can also carry up to four propane tanks and a collapsible bladder tank in it. The water heater itself will heat the water up by 86 degrees Fahrenheit with the maximum of 125 degrees. And you will be able to heat up 40 gallons of water with a single Coleman propane bottle. The heater can operate on either the fast-charging lithium-ion battery in it or through direct power feed. It also has an indicator that will tell you when you have to charge your battery. Once you finally get to your camping site, all you have to do is simply connect everything. Take the water tank, connect it to the pump and the hoses, set the temperature and enjoy your hot shower. You can also use the shower head as a sink faucet, as the H2Oasis offers a handy holder. Alternatively, you can use the shower head as a sprayer. After all, it does boast a six-foot no-kink hose. Pair that with Coleman’s famous multi-directional fitting, and you can direct the water any way you want. In all honesty, most people who are looking for a portable water heater just want one thing from it – to give them a hot shower. And all the bells and whistles that might come with it are great, but not what they came for – especially if they make the entire unit more difficult to assemble. That is why we love Camp Chef HWD5 Triton. For a lot of the portable water heaters, you would need a bit of expertise to set up the water supply. However, you can use Triton with a regular water hose from your garden. And, you don’t even need a wall to mount it. Instead, this water heater comes with a handy stand you can use. It also has brackets you can use to hang it. It also comes with pretty much everything you will require to set it up, including the easy-turn hose connector made out of brass and an 8-foot hose. The heater itself is 12 x 4 x 15 inches, and it weighs in at just under 15 pounds, with the stand. This small heater will give you around 1.5 gallons of hot water on demand. You can easily adjust both the heat and the water flow and fully enjoy the 34,000 BTU/hour output. Just like other high-quality heaters, it has automatic ignition when the water reaches the necessary pressure. The minimum water flow is 0.5 gallons, and with that flow, it can heat the water up by 102 degrees. One thing we didn’t have the time to test just yet is the time it takes for this heater to use up a standard LP tank. However, the manufacturer boasts an incredible amount of time. Namely, this heater can work for up to 11 hours, depending on the settings. And, 11 hours of constant work is definitely impressive in our book. Costway has come through big time with this propane heater. It is ideal for pretty much any camping trip you can think of. It will help you get instant hot water for showers, dishwashing, and even cooking. The overall dimensions of the heater are 13 x 10 x 11.5 inches, and it weighs in at around 17 pounds. And, even though it is light, it still puts out 18,000BTU. And we also feel that we have to comment on the excellent minimalist design of the unit. It simply looks great while working. The shower head extension will allow you to pump out 0.8 gallons of hot water per minute on average; not to mention that the quick connect system allows you to set everything up with no expertise. This unit also comes with a number of safety features. That includes the overheat protection which will shut the heater off if the temperature goes above 167 degrees. It also has anti-dry combustion safeties installed, as well as the wind protection and the off-balance switch. These features, working together, make sure that your every trip is perfectly safe. So, if you are looking for a safe-to-use heater that also looks good, this might be the one for you. In the end, the decision is up to you. The list we gave you here is but a list of recommendations we have. Our top pick is the Eccotemp L10; Camplux 5L is great for taking camping, and Coleman H2Oasis performed consistently even in extreme conditions. Hopefully, our list will help you find the best portable propane hot water heater for camping.